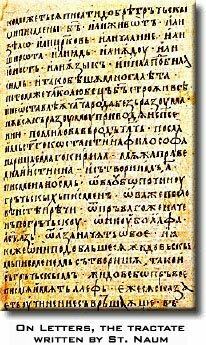 Crnorizec Hrabar was an anonymous writer from the Slavonic medieval literature, who was assumed to live in the 10th century. The pseudonym Crnorizec Hrabar means Brave monk. Some Slavists, for instance Vinegart and Konevski believe that that pseudonym was used by one of the most distinguished Saints Cyril & Methodius disciples, Naum of Ohrid. Crnorizec Hrabar wrote "O pismeneh" (On Letters), where he talks about the Slavonic literacy and defends it from the members of the German clergy who denies its existence. Defending the Slavonic literacy, Crnorizec Hrabar proved and justified its existence.